I finished up Insanity at the beginning of the month. After a two week break, I decided to start P90X. These are my initial impressions with P90X. The warm ups with P90X are really warm ups. Tony Horton is a hyperactive, mad man. But, P90X goes at a much slower pace than Insanity. Tony talks incessantly. But, he's a pleasant enough guy and his chatter keeps me from getting bored. You're doing set after set of lifting. So, I kind of enjoy his keeping it light. I was worried about how he'd be as a yoga instructor But, he was was able to bring it down for yoga. Insanity is like a sprint (a LONG sprint), while P90X is more like an endurance race. P90X workouts are much longer than Insanity workouts. I found myself at the beginning of P90X routines thinking "Oh, this is easy. I could do this all day." But, by the end, you feel you have been doing it all day and are pretty spent. Even in the first week, most workouts are pushing an hour and a half if you count the Ab Ripper X routine that is a 17 minute add on on the days you're not doing cardio (three days this week). So, while Insanity requires a greater commitment of body and mind. P90X requires a greater commitment of time. P90X has a lot more strength training and requires weights (or bands) and a pull up bar. P90X also provides more variety. That's great for those who are bored easily. While Insanity is fantastic for cardio fitness, flexibility and core strength there's not as much of the bulking up exercises. 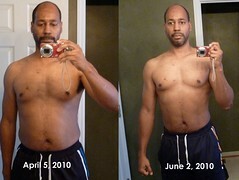 Shaun T. does a fantastic job of getting the most out of using just your body. But, without weights or a pullup bar there is only so much you can do to bulk up. OTOH, the "classic" P90X program is light on the cardio work. There is also a lean P90X variation that concentrates more on cardio. You take the same 12 disks and just do a calendar that involves more cardio. There is also a doubles program which gives you both. What is does is add a cardio routine to most days of the classic program that are missing cardio. But, now you're talking about some really serious time working out- over two hours a day. I'm doing the classic program. This week had 3 days of strength training working on chest & back, shoulders & arms and legs & back. It also had 2 days of cardio (Kenpo and Plyo) and a day of Yoga which is both strength and flexibility training. For those who like variety, P90X is the way to go. Pretty much every day of Insanity is cardio (some days more intense than others). The Yoga X workout was the most difficult yoga class I've ever taken and I've taken a few fairly advanced classes. You work up a good sweat doing the yoga class. The plyo workout wasn't as intense or as jarring as Insanity's version. But, it was good. One of the things that's great about it is, for those with joint problems, you don't have to figure out how to modify the moves. There is someone showing you the modified moves on the DVD. On the strength training days, if you have bands instead of weights, someone shows you how to use the bands. If you don't have a pullup bar or can't do pullups, someone shows you how to use bands instead. Kenpo X was my first experience with Kenpo. I really didn't think I'd be able to get a good cardio workout by just punching and kicking. But, man, I did. Kenpo X was actually a lot of fun and I can't remember the last time I said that about an workout. Today starts week 2 of P90X for me. So far so good. The only problem right now is I'm too weak to do any great number of pullups. But, hey that means more room for improvement. Right? Good stuff, Brian. Keep up the good work. My sister tried P90X, but found it boring. She likes the more dance oriented workouts. My wife's doing P90X with me. She's not so much into the lifting thing either. We'll see if she can stick it out to the end. The good thing about P90X though is there Yoga, Kenpo and the Plyo for those who like to jump around and those who like Yoga. I don't like the dance stuff because I'm just not that good a dancer.